If you find yourself in the position of searching for a party bus in Fowlerville, then your search has now come to an end. 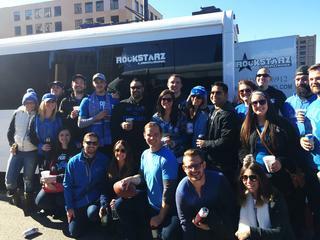 At Rockstarz Limousine and Party Bus, we specialize in not only delivering a quality experience to all of our clients, but we guarantee that this is going to prove to be a party bus that far exceeds your expectations. Whenever you want to rent a party bus, you will always be concerned as to the space that is available and whether or not it will reach your needs. That is not an issue on either count as we have not only sought to make the best use of the space to allow you to invite more guests, but we have also created an atmosphere that is unlike anything else. Our Fowlerville party bus rental service will blow your mind from the moment you step on board. From the décor, to the stereo system that blasts out the music as well as the laser light display, this bus will become your very own private nightclub giving you and your guests a night to remember. Our Fowlerville party bus service has been used by a number of people to help them to celebrate a wide range of occasions. From the normal birthday or anniversary, through to a bachelor or bachelorette party, or perhaps even just a space to have a party that is different to what you are used to, we can help with anything. Our main aim is simply to provide you with a time that you just cannot forget. So, if you live in the Fowlerville area and require a party bus, then give us a call here at Rockstarz Limousine and Party Bus. Alternatively, you can contact us via our website and a member of our team will be in touch to discuss your own individual requirements.